What do you do when you have a spark of creativity or an idea you can't afford to forget? Most of us reach for the nearest device—often the smartphone in our pocket or the tablet on our coffee table. But there's a lot more to a note taking app than simply tapping out a quick note. 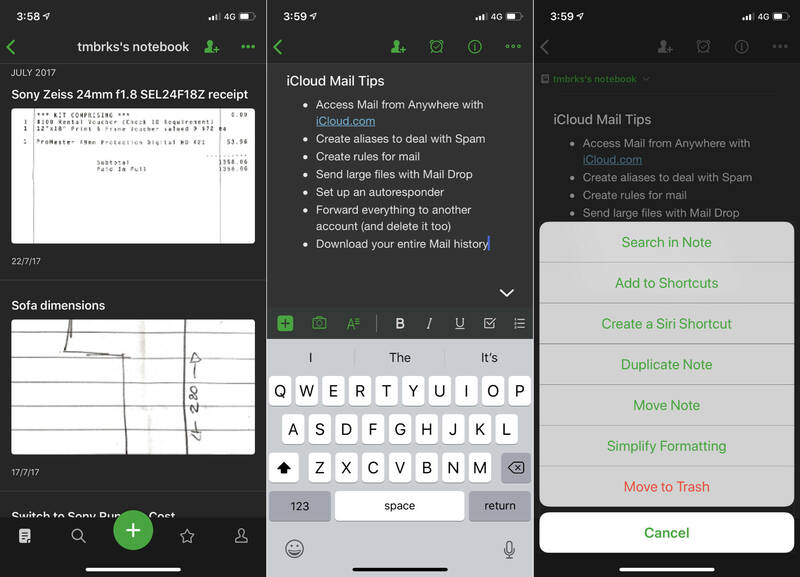 Both the iPhone and iPad offer excellent note taking apps that will change the way you record your thoughts, plan your days, and organize your life. Many of these apps are aimed exclusively at Apple users, while others offer an iOS-friendly window into a broader ecosystem. We've put over 30 of the best note taking apps for iPad and iPhone under the microscope in a bid to find the absolute best of the bunch. Here they are. What Makes a Great Note Taking App for iPad and iPhone? Typing a note on your iPhone or iPad might not be the fastest method of entering text, but it's the best option you have when you're away from a keyboard. Snapping images or scanning documents with your phone or tablet and storing them in an easily searchable digital archive is a good habit to form. And that microphone allows your device to double as a dictaphone, with many note taking apps supporting audio. For a more tactile experience, why not try hand-writing your notes? Most note taking systems support touch-based scrawl of some type, and others rely on it. The strides Apple has made with its Pencil stylus on the iPad Pro has not gone unnoticed by app developers. If you've previously written off the iPad as an effective drawing or handwriting tool, it might be time to try again. In any case, no single app is perfect for every use case. It doesn't make a lot of sense to compare a free app that's light on features by design with a pricey heavyweight, particularly when both approaches have their merits. We've tried to find the best note taking apps to satisfy our main criteria, regardless of the approach taken by that app. We favor apps with unique features or those that are the best examples of their kind. In order to be inclusive of all needs, we haven't limited our selection to plain or rich text apps. Notes may be web clippings, photos, typed markdown, scanned documents, audio logs, sketches, handwritten notes, or diagrams. In some instances, notes can be a mixture of all of these things. All of the selected apps satisfy our requirements for a common-sense system of organization. This is usually achieved with some form of notebooks, folders, or tags. Access to a reliable search function is another important criterion for selection, and options like the ability to filter, sort, and save search results have also been considered. When it comes down to it, finding your notes is just as important as recording them in the first place. You also need to be able to access your notes when you need them. All of our selected apps include the ability to sync over the cloud with other instances, either using the developer's servers or iCloud. Some include robust sharing options for providing copies of your notes to friends or colleagues, though this isn't a strict requirement for inclusion. A sense of value is another important consideration. Some apps are free, others paid for outright, while some make use of an ongoing subscription model. Most of our paid-for recommendations come with a decent free tier or trial period. Not everyone can justify the expense of a pricey note taking app, but at the same time, some of the best apps aren't free. While many apps can double as note taking apps, we avoided including apps for which recording notes is not the primary purpose. That means we excluded word processors, journaling apps, and sketchbooks, among others. Apple Notes manages to win over many users simply by virtue of it being installed on every iPhone or iPad that leaves the factory. And that's okay. If you're looking for an easy-to-use note taking app that's ready to go, Apple Notes is an attractive option. Apple Notes can capture rich text and mixed media notes from practically any corner of the iOS operating system. These notes can also contain checklists, tables, images, Apple Maps locations, audio recordings, and document scans by way of the included document scanner. Tap the plus button while composing a note, and then select Scan Documents and point your camera accordingly. You can also add your own drawings or handwriting by choosing Add Sketch from the same menu. Your notes are organized into a system of folders of your choosing. Subfolders can be created, but not on iOS devices (you'll need to do so on a Mac or via the web interface at iCloud.com). You cannot organize your notes into tags, but there's nothing preventing you from deploying your own #hashtags and searching for them. While there's no optical character recognition (OCR) for scanned documents or images, handwritten notes are searchable—provided your scrawl is legible. Apple Notes has a few other smart features for users who want more than basic note capture. You can lock notes by swiping them to the left and tapping the padlock. Add other users to your notes and collaborate by tapping Add People at the top of the note and entering their email. Because Notes is deeply integrated into iOS, you can save items as notes from almost anywhere using the Share button, then choosing Notes. Sync takes place over iCloud, with all users receiving 5GB of free iCloud storage space. As long as you're logged in to the same iCloud account, synced notes will appear on any other iPhone, iPad, iPod Touch, or Mac devices and on the web at iCloud.com. The clue is in the name when it comes to Simplenote. This is an aggressively simple note taking platform, with a version available for every major platform. The app allows you to capture plain text notes that take up very little space on your device. 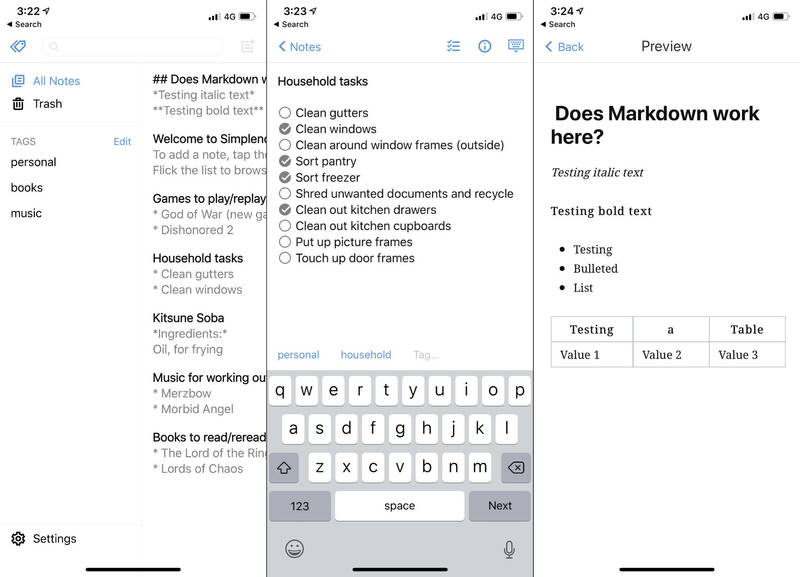 You can use Markdown by tapping the Information icon and enabling the Markdown toggle, then swipe the page to the right to view a Markdown preview. You can't embed images or audio files, add PDF attachments, or include checklists. Since everything is stored in plain text, the app is highly responsive, and notes take very little time to render and display. Organization takes place by way of tags alone. There are no notebooks or folders—simply deploy your own system of tags in the tag field on your notes. These tags then live in the sidebar to the left of the screen, so you can browse by tag with a tap if you want. Since Simplenote is free, there are no features hidden behind in-app purchases or subscriptions: You get access to everything. That includes passcode or biometric security, a dark mode theme, and syncing with other instances of Simplenote. All you'll need to use and sync Simplenote is a free WordPress account. If your idea of note taking relies on the typed word alone, Simplenote is the perfect tool for the job wrapped up in a delightful free package. Standard Notes is a Simplenote alternative with a focus on end-to-end encryption. The app supports locking notes with passcodes or biometrics, archiving notes for later recall, and the ability to work offline. It has a slightly different look and feel than Simplenote while satisfying the same basic plain text demands. Ultimately, Simplenote's wholly free ecosystem tips it over the edge when comparing the two offerings. 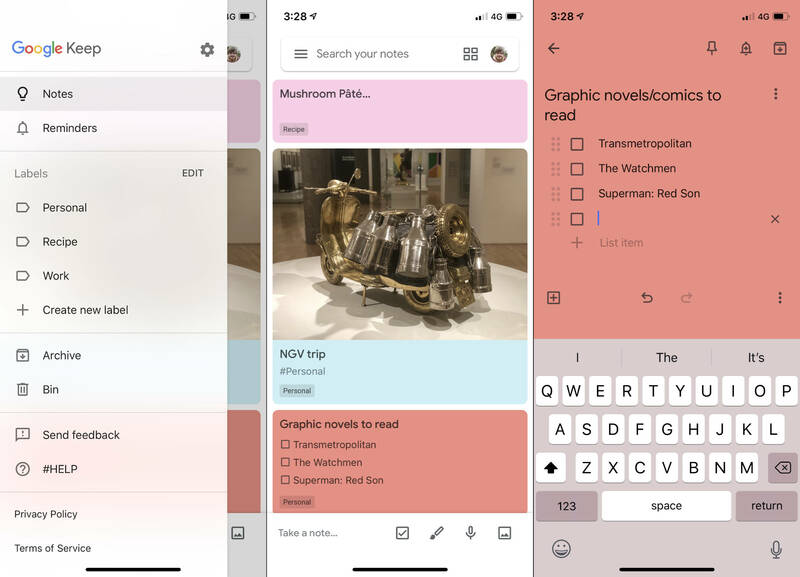 Google Keep is Google's own cross-platform note taking app, with other versions available for Android and the Chrome browser and OS. As of this writing, there are no desktop versions of Keep, which is a shame because the native iOS app is a pleasure to use. Google Keep places a strong emphasis on the visual aspect of note taking, presenting all of your notes in a scrolling list on the home screen—it ends up feeling like a scrapbook. The app allows you to take simple text notes, but you can't add formatting. You can capture checklists, sketches and handwritten notes, audio recordings, and images from your device's camera or the Photos app. It's also possible to mix any combination of these things within a single note. To keep your notes collection organized, Keep uses Gmail-like labels. The labels aren't color-coded, but you can apply multiple labels to a single note by tapping the three dots in the lower-right corner of a note and then choosing Labels and ticking all that apply. Tags can also be deployed anywhere within a note like a regular #hashtag, allowing you to filter by tag using the search engine. Finally, each note (not tag) can be color-coded with one of 12 background colors. These colors help differentiate your notes from one another on the slightly cluttered home screen. There are other ways to keep notes top of mind. At the top of a note, tap the bell icon to turn your note into a reminder at a date and time or place of your choosing. You can also pin a note to the top of your home screen using the pin button. Notes can be collaborative too. Tap the three dots on a note and tap Collaborators to add other users to a Keep note, allowing them to edit the note. You can also send notes from this menu without having to add users as collaborators. Sync takes place for free over Google's own servers, with anything stored eating into your total Google account storage. Everyone with a Google account gets 15GB free storage for use with Google's other products like Google Drive, Gmail, and Google Photos. While technically a note taking app, Drafts 5 offers so much more in its unique approach to typing on your iOS device. The primary focus is on creating actionable notes, rather than storing anything and everything (though you could use it for that too). So what is an actionable note? In this case, it's an email you're drafting, a text message you need to send, a blog post you might be working on, or simply a passage of text that you want to use elsewhere. When you first launch Drafts, you're greeted by a blank canvas where you can start typing. This is the first major change compared to most note taking apps: Drafts is always ready to go. In no time, you can capture plain text notes and audio recordings. All of your new notes are first stored in your inbox, and from there you can decide what to do with them. Organization mostly involves tags, though it's also possible to flag and archive notes. Both flagged and archived notes appear in separate sections for easy perusal. You can search for your notes as you would in any other app, or use Drafts' system of filters for applying multiple tags to a search query. The real magic of Drafts is what happens to your notes once you've written them. Tap on the Drafts icon in the top-right corner of the screen to see a list of one-tap actions you can perform with your note. 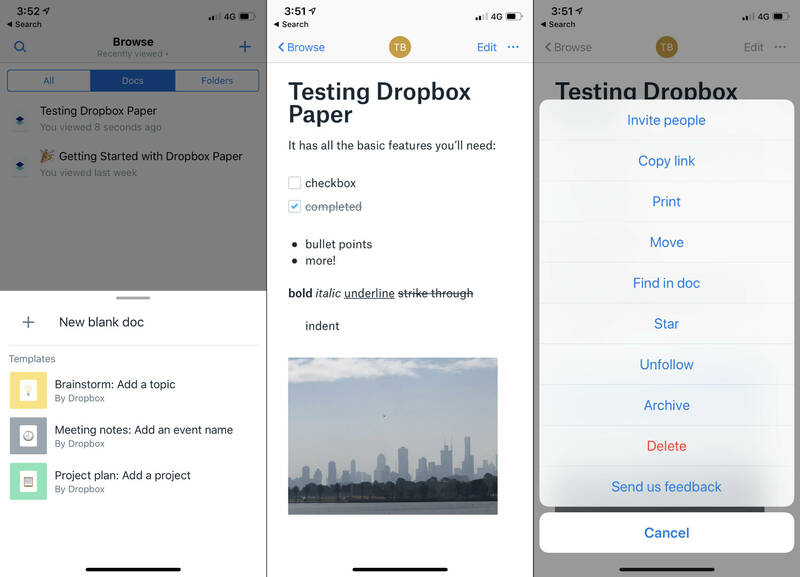 These include sending the text to the Messages app, launching a new Mail draft with your text ready to send, or saving your text to Files as a separate file. This doesn't take place via the usual iOS share sheet, but instead instantly sends your text to the app of your choosing. These actions are varied. You can use Drafts to search Google, create a new Reminder, save to third-party cloud services like OneDrive and Dropbox, compose a Tweet, or create a task in third-party apps like Things and OmniFocus. 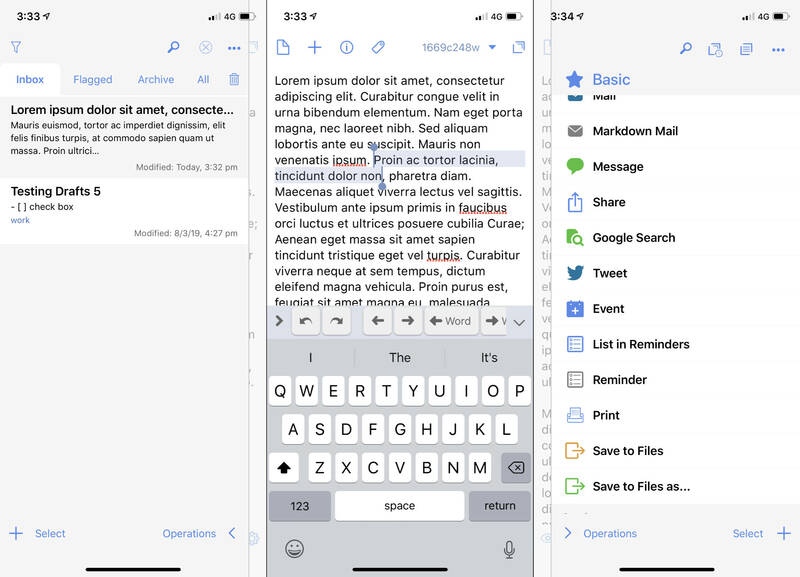 Not only is Drafts a note taking app on its own, but it's also an extension that plays nicely with some of the other big players like OneNote and Evernote. Take Drafts to the next level with a Pro subscription that allows you to create and edit your own actions, unlock custom icons and themes, use additional widgets and share extensions, and more. Drafts 5 Price: Free with limitations; Pro subscription is $19.99/year or $1.99/month. Zoho Notebook is another free note taking platform that strikes a great balance between ease of use and functionality. It's the perfect alternative to Apple Notes for users who don't solely reside within the Apple ecosystem. There are Zoho Notebook apps also available for Android, Mac, and Windows platforms, and they're all free to use. Zoho takes a card-based approach to note capture. Every note you take is a card, with different cards used for different types of content. There are cards for rich text notes, checklists, audio recordings, photos and images, sketches, and files like PDFs. By composing a new text card, you can mix any number of these different elements in a single card. Notebooks with customizable cover images are used to store your cards. It's also possible to deploy tags anywhere within a note by typing a #hashtag, then tapping on the tag box that appears. Individual notes can be color-coded using one of 14 pre-selected colors or a color wheel. These colors make it easy to differentiate different note types, provided you pick a system and stick to it. Use the camera feature to take photos directly into notes, or scan documents and business cards for safe keeping. You can also use your fingers or a stylus to sketch or handwrite notes, but unfortunately, your handwriting isn't searchable. Syncing is fast and invisible. You'll need a Zoho account in order to use the app at all, which is how the Notebook handles syncing with other instances of the app. You can export your notes as a PDF, Zoho's ZNote format, or via the usual iOS share sheet options. The whole platform is free, with no restrictions on the number of devices you can sync and no upload quotas. Automate Zoho Notebook with Zapier's Zoho Notebook integrations. Notability is a complete note taking app with support for both typing your notes and writing them out by hand. The app is probably best for iPad Pro users with a Pencil since the inking technology has been optimized for use with Apple's stylus. But it's still easy to take handwritten notes on an iPhone or regular iPad, with or without a stylus. The app supports simple text input with bullet points and checkboxes for creating lists or to-dos. Tap the input method icon at the top of a note to choose from handwriting, highlighting, an eraser, or a lasso tool. You can also tap on the camera icon to add images from your camera or Photos library. On an iPad Pro, you can use the Apple Pencil to draw and write directly on the page. On an iPhone, an assistant in the lower-right corner of the screen allows you to enter handwriting with your finger. The assistant will scroll the page for you, allowing you to enter small and neat handwriting. In reality, it's a slow process, so Notability's handwriting prowess is best reserved for iPad users with a stylus. In addition to recording text and handwritten notes, Notability also includes the ability to record audio. This is perfect for use in lectures or business meetings since you can use a feature called Note Replay to play back both the audio and the ink recordings in time with each other. When you replay an audio recording and enable Note Replay, your notes and drawings will appear just like they did when you initially made them. Notability's superior inking abilities are put to further use in its capacity as a PDF markup tool. Organization takes place by way of dividers (folders) and subjects (subfolders). And you can search the entire contents of your notes—including handwriting—from the search bar. You can even convert your handwriting to text by selecting it with the lasso tool, tapping it, and choosing Convert to Text (you'll get a preview first too)—and it works surprisingly well. Sync is performed over iCloud with other instances of Notability, including the separately-sold Mac app. Notability is a powerhouse of the note taking world, with excellent handwriting conversion and business-class markup features, at a sensible price point. 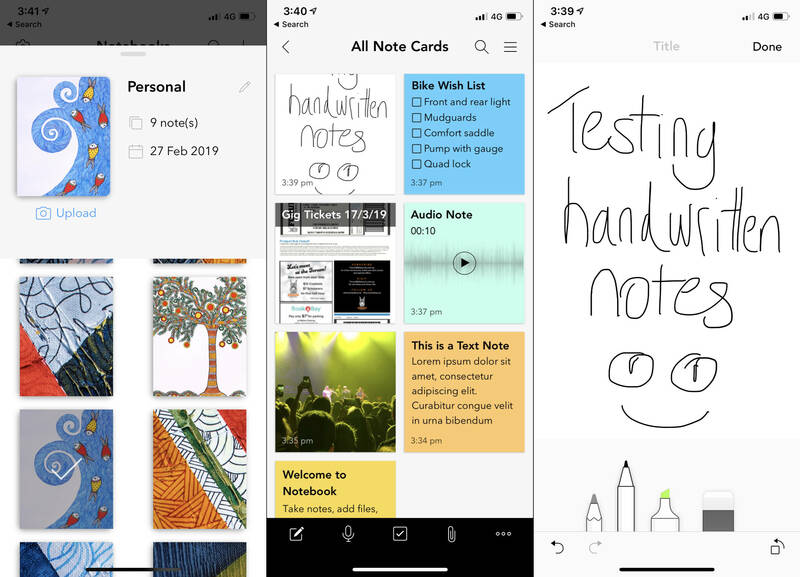 Noteshelf 2 ($9.99) is another handwriting-focused note taking app. Just like Notability, it has excellent inking features, a range of pens, pencils, and highlighters to choose from, and a library of paper styles and templates. 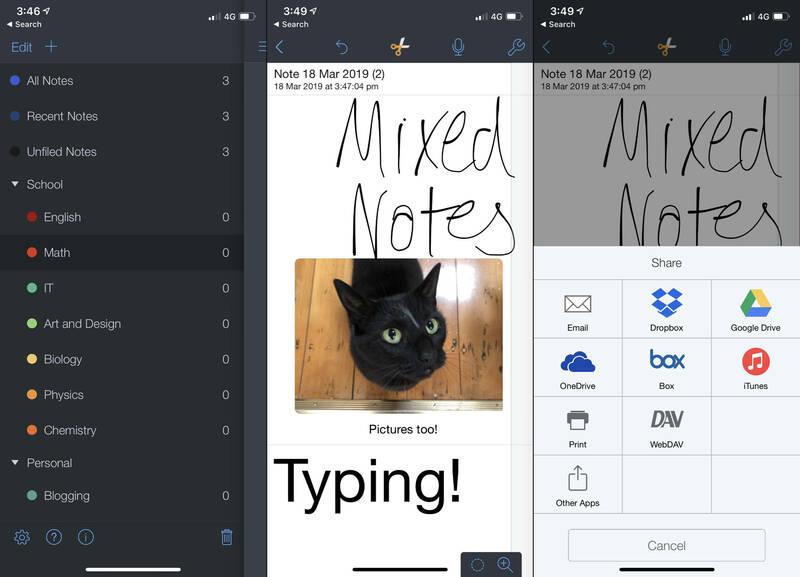 Unlike Notability, Noteshelf 2 can sync with Evernote and export to cloud services like Dropbox, Google Drive, and Box. For this reason, Noteshelf 2 might be the better choice for someone already working with Evernote who wants a superior digital inking experience—provided you don't need OCR. Paper by Dropbox isn't the most feature-rich note taking app available. It supports rich text capture with the usual bullet point, checkbox, and text formatting options you need to author quick notes, to-dos, and lists. You can insert images directly from your camera or Photos app, but you can't record audio or create handwritten notes. What makes Dropbox Paper so special are its collaboration features. Dropbox Paper allows you to invite other people to collaborate on notes with you: Tap your user icon at the top of a note, and type in email addresses to add users to a note. These notes are accessible via the Dropbox Paper apps for iOS and Android and using the web app at Dropbox.com. Once invited, users can edit notes and leave comments by highlighting an element and tapping the New Comment box at the bottom of the screen. Notes (or Docs, as Dropbox Paper refers to them) are organized into folders. Folders can be shared with collaborators just like notes can, providing quick access to an entire folder's worth of notes in a few taps. You can star documents, which then appear in their own Starred tab for quick access. The Notifications tab should also bring you up to speed with any changes made to your notes recently. There are a few other nice features that make Paper perfect for team use. Mention someone by their @username to draw their attention to the current note. Use templates to quickly take meeting notes, plan a project, or hold a brainstorming session. Despite the collaborative and web-based nature of Dropbox Paper and the cloud storage platform it's built upon, Paper works well offline too. All of your docs are downloaded and stored locally, with changes pushed to the server when you get back online. Dropbox Paper is free, though you'll need a Dropbox account in order to use it. Everyone who signs up for a free Dropbox Basic plan gets 2GB of storage for free. Quip also offers a collaborative note taking experience from the team that brought you Salesforce. Unlike the desktop version, Salesforce integration doesn't seem to feature in the iOS version. Instead, you get a platform on which to create and share documents, spreadsheets, and chat channels. You can incorporate aspects of your spreadsheets into your documents, organize everything into shared or private folders, and @mention your teammates to draw attention. Quip is a serious tool, with a price tag of $30/month for a small team of five to get started. Evernote is a titan of the note taking world. In fact, it's more than a note taking app—it's an entire ecosystem of apps and integrations that's been built upon and added to since it first debuted in 2008. For some users, this feature-heavy approach has resulted in the ultimate note taking app. For others, the heavyweight nature of Evernote is overkill. The note taking platform is a depository for anything and everything. Capture rich text notes with full support for file attachments, in-line images, audio recordings, and sketches. Create tables within your notes, reference other Evernote notes with inter-note linking, and turn any note into a reminder by tapping the alarm clock icon at the top of the screen (Evernote will send you a push notification on a date and time of your choosing). The Share Note button lets you collaborate on notes with other users, but you can't work on them concurrently. Organization is another Evernote strong point. The platform uses "Notebooks" to store your notes, with the ability to group Notebooks together into Stacks. Tap the Information icon at the top of a note to add tags. Add notes to your shortcuts for quick access from the Shortcuts tab. Evernote's search feature is second to none in its ability to search note titles, tags, body text, attached documents, and even images that contain text. The iOS app also includes a handy document scanner, which can intelligently detect document edges as you snap them. Evernote works with Siri shortcuts, which means you can create audio commands for Siri to add items to a specific note. But all of these features come at a price. Evernote's basic free plan has an upload limit of 60MB/month and two devices. That means you can sync your iPhone and your Mac, but not your office PC or iPad. Offline access also isn't included in the free basic plan, which means your notes become inaccessible without an internet connection. A premium subscription relaxes these restrictions and provides other benefits like app integrations with Slack and Outlook, the ability to link files on Google Drive, and more. Evernote Price: Free with limitations; Premium plan starts at $9.99/month with a pricier business plan available. Automate Evernote with Zapier's Evernote integrations. OneNote is Microsoft's answer to Evernote. Unlike Evernote, OneNote offers all of its features for free. There is no monthly upload quota since OneNote shares your OneDrive cloud storage space instead. You can capture rich text, file attachments, audio, images, and checklists. Unfortunately, the iOS version of OneNote currently lags behind the desktop version, with one notable absence being Microsoft's smart tags. It's also not as quick as Evernote in terms of creating a new note, but it's still worth a look if you want a free alternative to Evernote. Which Note Taking App Is Best for You? For most users, Apple Notes provides more than enough features. 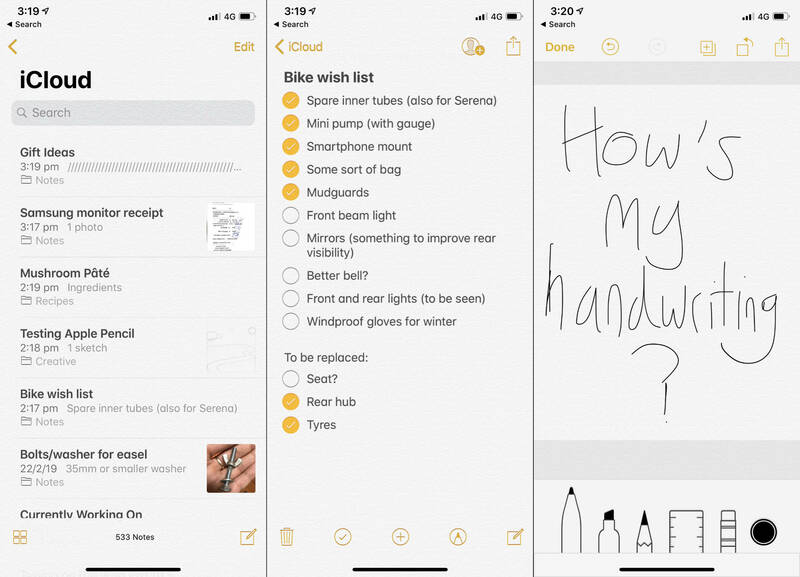 Since Apple overhauled the app a few years back, Notes is a great platform for storing your thoughts, documents, and lists. It's collaborative and available on any Apple device, though non-Apple users will need to use the web version at iCloud.com. If Apple Notes doesn't scratch your note taking itch, try any of the other apps on this list. Think about what you value most in your note taking—Simplicity? Handwriting ability? Visual appeal?—and then select the app that offers that feature.